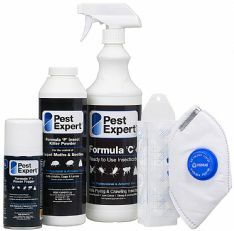 Pest Expert Formula 'P' Carpet Moth Powder, has been specifically formulated for the fast eradication of carpet moths. Having only recently been approved by the UK's HSE for both professional and amateur use, this unique product has been manufactured and developed to control all life cycle stages of the carpet moth, including eggs, larvae and adult. Shake well and remove cap. Apply evenly to carpets and more liberally under furniture, around edges of a room and to areas where carpet moth damage is noted. Leave down for at least 30 minutes, before vacuuming up. Formula P Carpet Moth Powder is an essential component in any comprehensive capet moth treatment programme. For best results, use together with Formula 'C' Carpet Moth Spray, for a long lasting invisible residual and Formula 'P'+ Power Fogger to fumigate any the entire room, ensuring the kill of any adult carpet moths which may not be directly in contact with treated surfaces. ​This product is safe for application in areas used by adults, children and pets, providing the directions for use shown on the container are followed and all powder applied is thoroughly vacuumed up, therefore removing all deposits from treated areas before re-occupying. Please Note: All of our Carpet Moth Killer Kits now contain Formula P Carpet Moth Powder as standard. These kits and are tailor-made to provide all the necessary components you need to carry out a comprehensive, successful carpet moth treatment, as well as being supplied with a step-by-step advice sheet for eay use. Very easy to apply. Impressed. Product's easy to use and arrived the day after I placed the order. Very good service. Decent products at a reasonable price, well packaged and despatched speedily - what more could you want? Successfully treated the carpet. Moths should find a new home in the future. Easy and clear instructions for use. Would recommend the product to other customers. The products were effective, the instructions were clear and they arrived the day after I ordered them. Excellent customer service. Goods arrived the next day, fair price, thank you! Good product well priced, prompt delivery would recommend it. everything arrived the next day as promised and the results so far are great! Good advise available on the website too to help with my moth problem. updates sent on the progress of the delivery too. Great service. Great website that explains everything and efficient service. The powder arrived promptly. Not sure that the moths like it much though. Everything arrived quickly. The product was just as described and easy to use. I know feel confident that I am free from moths. I would recommend. Quick and efficient service and a very effective product which i would recommend to anyone who has a house overrun with moths. Very reasonably priced product too. Helpful, Informative Staff & Very Fast Delivery, Good Products. I found the staff at Mothkiller.co.uk to be very friendly, helpful and well informed. They were able to advise me and tailor an order to my particular needs. The order then arrived next day. I have made a subsequent order with them and again the order was handled well and arrived next day. I have found their products to be effective (so far) and of a competitive price. I would recommend both the company and their products. EXCELLENT RESULT The Pest Expert products eradicated our carpet moth infestation quickly and easily. Great product and service. One very happy customer. Efficient Service The service was excellent. Everything arrived exactly when it should have. I was kept informed throughout the transaction. I have started to use their products. So far so good. The moth killer powder was easy to use and appears to be very effective although I have not yet finished vacuuming it all up. Hopefully, will not have to use the fogger. The delivery was spot on and very efficient. e-mail sent to say when it would be delivered and was exactly on time. Was horrified to discover carpet moths had eaten part of a beautiful persian carpet. A quick trawl of the internet found these guys whose product sounded right for what I needed. The order was placed & delivery was confirmed for the next day. I recieved updates on the progress of my order even down to a time slot of 1hr. The delivery was made almost exactly at the half way point of the time slot. I have used the products on the affected carpet but will be back for more to do the whole house. The fogger was great once I had worked up courage to set one off! 2nd time I've used mothkiller. Rang them to see whether I needed another 'kit' or just additional items. Good professional advice given, not selling for the sake of it. Bought clothes moth kit first time and carpet moth additional items second time. Excellent service Very clear instructions, easy to follow, and easy to use. Fingers crossed we have completely irradiated the nasty beasties! Time will tell. The moth killer powder was easy to use and appears to be very effective . The delivery was spot on and very efficient e-mail sent to say when it would be delivered and was exactly on time.